Unless you’re lucky enough to live in a tropical paradise, you likely know the winter hair struggle all too well. Cold, dry air can wreak havoc on hair of any type, and naturally curly hair is particularly vulnerable to the elements. The dryness! The itchiness! The frizz! We have over a month left of winter left here in North America, so the struggle is far from over. You can sit back and wait for spring – or you can try these methods to revive your dead, brittle winter hair. As a curly-haired person, it’s always crucial not to wash too often, or use a shampoo that’s too drying. But this becomes even more important in the winter, when you need every ounce of moisture that you can get. It’s helpful to switch to a totally different shampoo in the winter than the summer, one that’s significantly more hydrating and won’t strip your hair, like the Elucence Moisture Benefits Shampoo, or the Briogeo Curl Charisma Rice Amino + Avocado Hydrating Shampoo. Dry, frizzy hair tends to lead to breakage and split ends. You’d be surprised how much even a simple trim can revive your hair! By removing any wintertime damage, you’ll give your healthier strands a chance to shine. Some types of haircuts, like a Deva Cut, will also make your hair fluffier and more voluminous. If your scalp is just as dry as your winter curls, try applying natural oils like coconut oil, tea tree oil, and peppermint oil to your scalp at night time before wash day, or throughout the week as needed. Coconut oil adds plenty of moisture and protection, while tea tree oil and peppermint oil soothe inflammation, relieve itchiness, and restore the scalp. If your hair is dry and brittle, you should be applying an intensive hair mask at least once a week. It’s also important, though, to use a deep conditioner that actually works. Look for a silicone-free hair mask that’s rich with moisturizing oils, butters, and other natural ingredients. Naturalistas love the DevaCurl Melt Into Moisture Matcha Butter Conditioning Mask, the Mielle Organics Babassu Oil Mint Deep Conditioner, and the Soultanicals Afrotastic Curl Elastic Deep Conditioning Treat. Lastly, let’s talk about the importance of heat. No, not the blow dryer or the straightening iron. Instead, it’s time to pull out the hooded dryer, the steamer, and the heat therapy cap. Heat is incredibly helpful for maintaining moisture in the winter. It opens up the hair cuticle, allowing moisture to penetrate your strands more effectively. 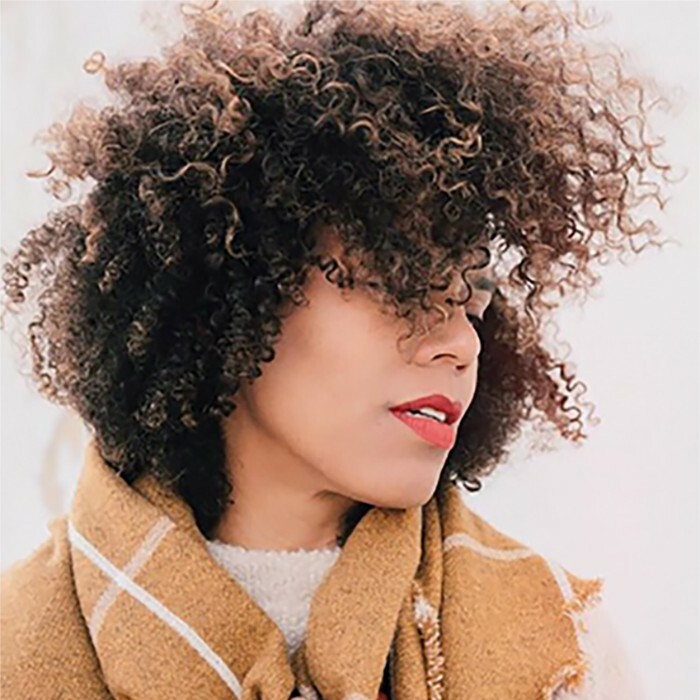 The “greenhouse method”: One mild way to add heat is the “greenhouse method,” which entails applying (hot or cold) oil, butter, or deep conditioner to your curls and then wearing a plastic cap to trap the moisture and raise the heat. This Deep Conditioning Hair Cap System from Briogeo is basically the greenhouse method in a box. Hair steamers and other gadgets: If you need even more heat, the most effective method is a hair steamer. Steamers are an investment, but they’re so worth it – it’s like an actual spa for your hair! You can also sit under a hooded or bonnet dryer while your hair mask does its work – about 15 minutes. Alternatively, you can buy a microwavable heat therapy cap. Hot oil treatments: Hot oil treatments are another excellent way to add an instant dose of heat and moisture, and it’s easy to make your own at home. Olive oil, jojoba oil, avocado oil, and coconut oil all work well for hot oil treatments. To safely heat the oil before you apply it to your hair, pop it into the microwave for a few seconds at a time, or put the oil container into a pot of hot water. Test it on your wrist, then apply it to your hair and cover it with a plastic cap for 30 minutes. What’s your favorite way to revive dry, brittle winter hair? Tell us your tricks in the comments!